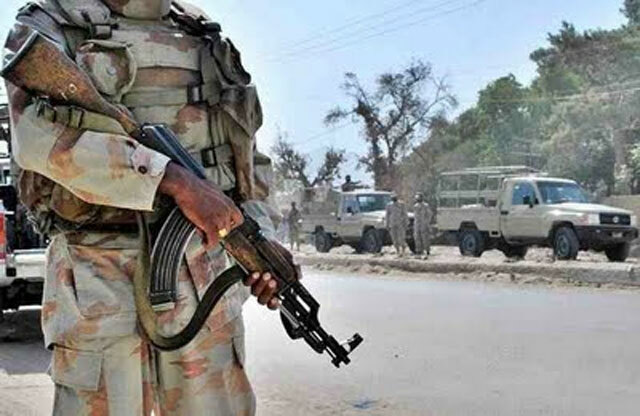 QUETTA: Six security officials were martyred in an intelligence based operation conducted on a terrorists’ hideout in Wakai area near Buleda, Turbat, Balochistan, on Friday. The operation also resulted in four terrorists being killed as they attacked a convoy of security personnel with heavy fire near the border with Iran. Terrorists targeted one of the vehicles of security forces through an IED. The forces responded with immediate retaliatory attack and killed four terrorists in exchange of fire. The security personnel who were martyred in the incident include: Naib Subedar Gul Shahadat (Karak), Naik Laal Khan (Lucky Marwat), Naik Sajjad (Lodhran), Sepoy Anwar (Karak), Naik Nawaz (Taunsa Shareef) and Sepoy Sajjad (Sialkot). Balochistan has been hit by a number of attacks on security personnel but the number of large scale incidents has decreased significantly since 2016. Provincial Information Minister Zahoor Ahmed Buledi told Reuters that six members of the Frontier Corps paramilitary force in charge of security in the region were martyred in heavy firing along a mountainous stretch of the road in the district. Militants linked to the Taliban, al-Qaeda and Islamic State have been operating in the province which borders Iran as well as Afghanistan. Last month, three militants from the separatist Baloch Liberation Army stormed the Chinese embassy in Karachi, martyring four people including two policemen. They were shot and killed by police before they could force their way in a car packed with explosives. In July, a suicide bomber detonated in the middle of a crowded election rally in the province, killing 128 people including electoral candidate Siraj Raisani. Islamic State claimed responsibility for the blast.